Anti-abortion protesters march around the Kansas Statehouse in 2017. Kansas lawmakers want physicians to face criminal penalties if they don’t repeatedly tell women seeking drug-induced abortions that they may be able to interrupt the process partway through. That comes despite a lack of rigorous research that what’s being called “abortion reversal” works and amid concerns from the American College of Obstetricians and Gynecologists that the research supporting the treatment is unethical. 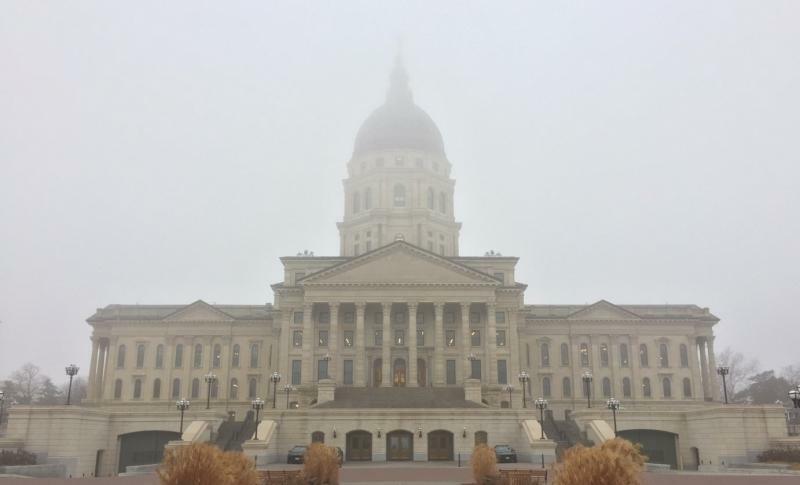 The bill that would make doctors inform patients the abortion pill, RU-486, may be reversible, sailed through the Kansas House, but has yet to reach a vote in the Senate. Daniel Grossman, a professor of obstetrics at the University of California San Francisco affiliated with the OB/GYN group, says doctors should consider reversal treatment experimental and only use it in clinical research governed by ethics rules. The Kansas House passed legislation to require abortion providers to post a notice in their offices, shown above, saying that the effects of RU-486 may be reversible. The purported reversal treatment involves the pregnancy-related hormone progesterone, which has long been used in fertility care. Still, Grossman says, research is needed specific to its use to stop an abortion. Delgado and the American Association of Pro-Life OB/GYNs, where he is a board member, say swiftly administering progesterone can save a pregnancy if women change their minds after taking mifepristone, the first of two drugs involved in abortion by medication. In the most common type of medication abortion (not normally recommended after the first 10 weeks of pregnancy), a patient takes mifepristone to block her naturally occurring progesterone — the hormone critical to maintaining a pregnancy. Within a day or two, she takes a second drug to make her uterus contract. Doctors attempting abortion reversal give doses of progesterone to counteract the mifepristone. The patient then refrains from taking the second abortion drug. So the question is whether administering progesterone increases those odds for a woman who regrets initiating a medication abortion. Delgado says it does significantly. His research appears in a journal co-published by an institute housed at the anti-abortion OB/GYN association where he serves as board member. Grossman, at UC San Francisco, says methods in Delgado’s research may well have inflated results. Delgado published his 2018 study on abortion reversal with his affiliation listed as voluntary associate clinical professor at the University of California San Diego’s School of Medicine. The school ended the relationship in 2012. He says he only found out last year because of a mailing mix-up, and the article was revised. However, the affiliation remains on his clinic website, the version of his 2018 abortion reversal research that tops Google searches and the US National Library of Medicine website. His OB/GYN association deleted the affiliation this week. A newly announced study at the University of California Davis aims to test whether abortion reversal works using the scientific standards that Delgado’s critics say he skipped. Results could be available as soon as next year. Delgado says he will conduct a follow-up randomized trial, too. In the meantime, he said, unborn lives hang in the balance, as does the wellbeing of women carrying them. Under the Kansas bill, abortion providers would need to post notices in their offices that it may be possible to reverse the effect of mifepristone, a.k.a. RU-486. They would need to give similar information in writing and either over the phone or in person at least a day before a woman takes mifepristone, and again after she takes it. Breaking the law would be a misdemeanor the first time and a felony after that. Bills requiring physicians to talk to patients about reversal treatment have surfaced in several states in recent years, and have passed in at least four. Rep. John Eplee, an Atchison doctor, introduced the Kansas bill at the request of Kansans For Life, a politically powerful anti-abortion group. He feels confident that using progesterone in an attempt to interrupt abortion is safe because the hormone has been used for decades for other purposes, such as in vitro fertilization. Though the Federal Drug Administration hasn’t signed off on using progesterone to reverse abortions, Eplee says prescribing drugs “off label” is common. Fifty-nine lawmakers cosponsored the bill with Eplee. It passed the House with a 85-39 vote along strict party lines. Democrats offered amendments to the bill in the House. One would have allowed doctors to opt out of telling patients that mifepristone may be reversible if that information runs counter to their own medical knowledge or ethics. Another amendment would have added notice of the American College of Obstetricians and Gynecologists’ concerns. A proposed constitutional amendment introduced this week would effectively ban all abortions in Kansas by declaring that life begins at fertilization. The incident Julie Burkhart remembers most clearly about the 1991 Summer of Mercy is the man who attached himself to the front gate of a Wichita abortion clinic using a U-lock. Burkhart was a college student working at one of the three abortion clinics open in Wichita at the time. Today, she runs the one of two clinics left in the city.